On Sunday morning, December 3, 2006, Franklin County lost life-long St. Albans resident and long-time Funeral Director, Howard “Bud” Heald, following an illness. Bud passed away at Northwestern Medical Center, with his family by his side. He and his family were served by the Palliative Care program at NMC, which aims to help individuals live well through the end of life and provide support to both patients and family members during these difficult times. In remembrance of Bud’s life, his family chose to have memorial contributions given to NMC’s Palliative Care program, so that others may be supported as they were. Contributions from the community in Bud’s memory resulted in both an engraved Rock (for a gift of $5,000 or more) and an engraved Leaf (for gifts of $1,000 or more) being placed on our Tree of Life, the hand-carved donor recognition sculpture that adorns the hospital entryway. Bud’s wife, Peggy, and family were so touched by the support of the Palliative Care program that they too decided to add their own engraved Leaf in thanks for the care they received during Bud’s illness and passing. "Words really don't convey the warmth of care and support each of us received from the members of the Palliative Care staff at the most difficult time in our lives," says Peg Heald. 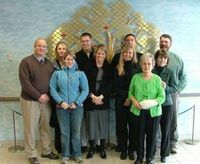 For more information about contributions to the Tree of Life, please call NMC Community Services at (802) 524-1239.